For his Eagle Scout rank, Colton High School junior Reed Schrosk was instrumental in getting trees planted along the community walking path that extends between the Colton Middle and Elementary Schools. According to the Boy Scout of America website, before an Eagle Scout Service Project is started, "a written plan must be submitted. It has to be pre-approved by the benefiting organization, the Scout Leader, the unit committee, and a district representative before work can begin." "The Eagle Project is not just about the community service aspect, but leadership and involving others in the task," Schrosk said. In March of 2016, Schrosk and 21 scouts, scout leaders, friends and family members planted 24 trees along the walkway that were donated by J. Frank Schmidt Nursery of Boring. The saplings included Gingko, honey locust, serviceberry, dogwood and American hophornbeam trees along the walkway. "The trees are meant for habitat for animals," Schrosk said. "As they grow they will provide shade and green spaces for people walking the trail. 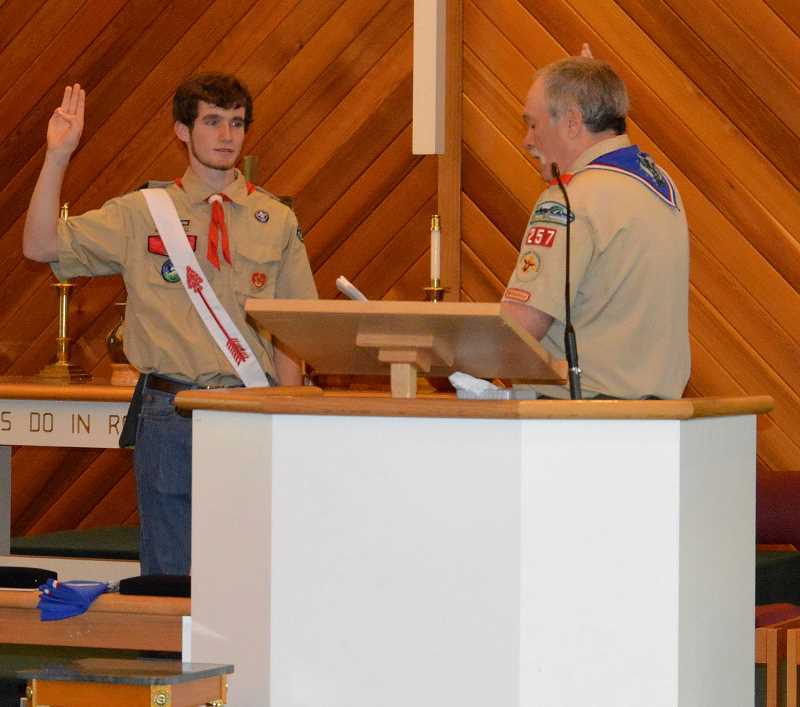 On Sunday, May 6, Schrosk, a member of Molalla Boy Scout Troop # 257, was presented his Eagle Scout rank, along with fellow Eagle Scout recipient Connor Bouck of Estacada, by their scout leader Gary Dumolt. Dumolt mentioned that only two percent of all scouts earn Eagle rank. The Eagle Charge was issued by Assistant Scoutmaster Gerald Tyler. The celebratory evening was held in the Molalla Methodist Church and was followed by a reception. Besides scouting, where he has already earned 27 merit badges, Schrosk plays bass guitar in the high school band and enjoys sports, as he plays soccer, baseball and basketball for CHS. He is also on the school's robotics team. When asked what the hardest part of the Eagle Scout project was he said: definitely the paperwork that he estimates took about 50 hours to complete. Colton's newest Eagle Scout is the son of Andrea and Damon Schrosk. His parents said they are proud of all the hard work and dedication Reed put into earning the rank and can't wait to see what he does next.